These are the notes that were handed out at Liquid Surf & Sail's store during the meeting on October 11, 2011. We had about 25 core riders show up from Boca Raton to Miami covering quite a few launch areas. Sincere thanks to all who came down to work to preserve our access and particular thanks to Jesse for opening his store up to us for the meeting. Most were from the Ft. Lauderdale and LBTS area, we will need folks to join into this effort from more launches from Boynton down to Hollywood if this is to succeed. Kiters in Southeast Florida form a small community. We may frequent each others launches, share common access problems and solutions. We need to acquaint the kiting community with the problems and usually easy solutions and work as a community to sort them out. No one person will put a dent in these issues which left unattended, make destroy our ability to kite. As a group we stand a much better chance of resolving these simple but serious problems. So, let's deal with this effectively so we can go back to kiting! The handouts that were passed out are reproduced below with comments. 1. Stay at least 150 yards offshore from lifeguarded beaches, particularly on downwinders! 2. DO NOT fly your kite over lifeguarded beaches. 3. Enter and exit the water at non-guarded or designated areas. 4. Respect and comply with instructions from authorities. 5. Be courteous to others (launch & walk downwind of bystanders) and avoid complaints. Plan your session considering actual and likely changes in conditions, your experience, skill and gear. 1. If you are doing a downwinder, BE SURE to stay at least 150 yards offshore from lifeguarded areas. They are easy to see and you should know where they are in advance anyway. 2. If you are forced to land on a guarded beach, safely land and secure your kite. Do not try to relaunch from the guarded beach nor walk out with your kite flying. 3. For example, if the out of bounds area is immediately to the north and winds are light or excessively strong out of the south and/or your kite and or board are too small or too large, DON’T LAUNCH THERE! Go somewhere else where the out of bounds area is well to the south. 4. For example, if the wind is strong or light and is onshore, and/or substantial waves are coming in from the east and you don’t think you will be able to readily make beyond 150 yards from shore AND avoid the out of bounds area … THEN DON’T RIDE THERE, go somewhere else with a more distant out of bounds area. This was prepared by Chris and Neil when there still was a concession at Tiki before they were forced to not renew their contract. It still applies today though. 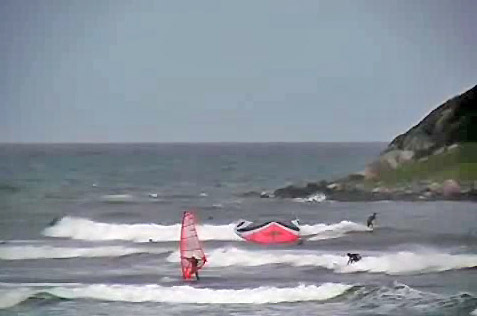 This is a technical and demanding launch, not for kiters that can't stay upwind. You must enter and exit though the launch corridor and stay beyond 150 yards until time to come in. Riding through the swim zone or walking kites back on the beach is unacceptable and will shut this launch down if it continues! There are conditions in which no one can ride upwind far enough to the east to get out of the launch corridor. If this is the case, don't ride here. A live cam shot showing guys going out in light wind immediately upwind of the out of bounds area. This is well north of Ft. Lauderdale by the way. You can't stay upwind and so drift into the guarded area. They then further aggravate things by walking back kites flying along the guarded beach. If you can't stay upwind from an out of bounds area, GO to where you can, in this case somewhere to the north of the guarded area. This just causes problems for access and will shut us down if it continues. Gio rides rescue for a Red Bull event recently on New River in Ft. Lauderdale, Fl. We also heard from FLBP lifeguard and EMT Gio Serano who is also a kiter. Lots of Lauderale kiters know and respect Gio. Gio was in a course in Northern Florida but joined in by telephone. He said they like kiters and would like to see them continue to ride in approved areas. At the same time they can't endanger others by riding through swim areas. We also need to consistently show the authorities the respect they deserve and not disregard what they say as happens at times. Lifeguards have a hard job and may be the ones saving our bacon if things go south, they have enough times in the past, they deserve our respect. The five points in Bold listed above summarize some of the main points Gio was making. 1. Don’t ride through the lineup, certainly not routinely. 2. Avoid riding the same wave. 3. Pass well to leeward or windward, not close by. 4. We can cover large distances there is usually no reason to ride close to them. 5. Anticipate wiping out, where your kite and lines might go and with what force. Make sure there is no one in that area. You’re the waterman, anticipate and control things. There are other things we can do to coexist this are just some of the more important ones that came to mind. An incredibly irresponsible kiter dropping into a wave with a ton of surfers in front of him. We are obligated to keep our kite and lines away from others. This was shot in Europe, not in Florida. 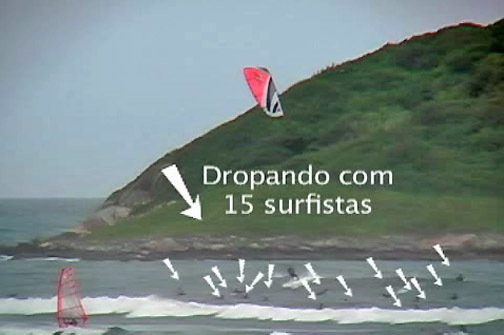 This kiter then wipes out and slams his kite and lines down into the water among the surfers?! Amazing stupidity, reflecting very badly on the rest of kiters. So, this is just a start, we need to get the kiting community to buy into this initiative and take it to the beaches. As a group we can fix this things, as individuals it is unlikely much needed change will happen. We hope to have a few more organizing meetings to kick this effort off. So, please read this over, think and talk about it and give the effort a needed hand at the beaches!